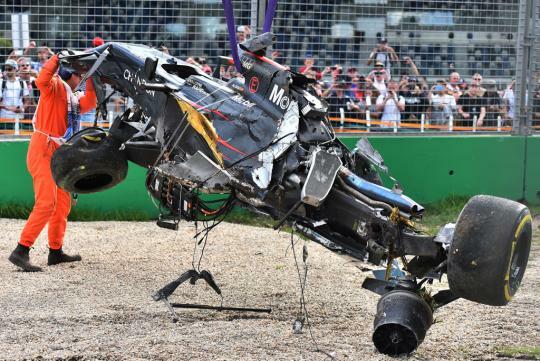 Fernando Alonso and Esteban Gutierrez both walked away from a terrifying crash during Sunday’s Australian Grand Prix that caused the race to be suspended after 19 laps. On the run down to Turn 3 at Albert Park, Alonso tried to move his car to the left-hand side of the track in a bid to get the outside line for the corner. Gutierrez shifted his car slightly left and appeared to brake earlier than Alonso expected, causing the Spaniard to run over the back of the Haas driver. Alonso’s speared into the wall before digging into the gravel at high speed, causing the car to flip in the air before coming to rest the wrong way up. Thankfully, Alonso was able to clamber out of his McLaren unassisted, while Gutierrez was also OK. Both drivers were taken swiftly to the medical centre as a precaution though. The race ultimately resumed after a 20-minute wait.